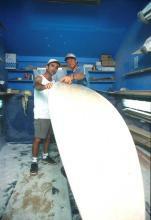 At the heart of a modern high performance board is the expanded Polystyrene core. To achieve minimum weight and optimum working characteristics, the core should be kept dry as possible. 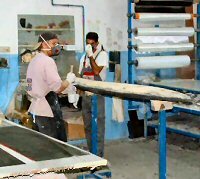 The low humidity at our Gran Canarian board factory provides the ideal conditions to achieve an extremely low humidity lightweight core. The board outline is cut using stencils and our special Proof Hotwire production system. An extra strong bottom sandwich is vacuum bounded to the core using specially selected glass fibres. Vacuum bonding the bottom sandwich ensures maximum strength combined with minimum weight. The mast and fin box are formed using a high-density sandwich blocks. The extra strong blocks give strength to those all-important high-stress areas. 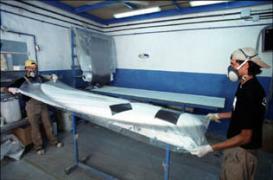 The deck is formed using a flexible sandwich, vacuum bonded to the core. The sandwich is created using closed-cell Polystyrene, bonded with woven carbon fibres and glass fibres. For added strength, the deck and bottom sandwiches are carefully bonded together, thus producing a genuine Monocock construction. Our experienced shapers carefully control the shaping process to ensure that all the design details are perfectly reproduced. Fin box, mast box and plugs are inserted. High-stress zones are reinforced with carbon, special satin and glass fibres. Proof boards are prepared for final sanding using our unique light filler system. 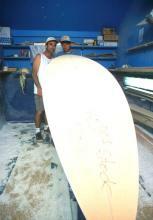 Final sanding, ensuring that all the details of the board´s design are exactly the same. To produce a high quality finish, Proof boards are coated with a specialized paint, which is then oven cured. Proof board are treated with a unique anti-slip surface. All Proof boards come with Gorilla footpads, Proof foot straps and Proof fins. 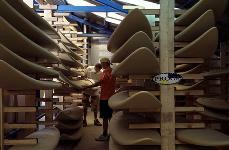 All fins have been handmade on Mauii. Finished boards are stored at a high ambient temperature. The Proof Board Company is unique in the marketplace. Proof boards are simply the best. Thanks to our unique and highly flexible production systems, Proof boards are constantly improving and evolving. Buy a PROOF board today and you are guaranteed the most up-to-date design possible.